Welcome to day one of our Deck the Halls with Inky Paws week! Hi crafty friends! My name is Keeway and I'm a crafty gal living in sunny California. I have loved to draw, color, and paint since I was a little girl and continued to explore this artsy world through various art classes growing up. This creative side faded away when I went to college and started working, but reignited when I discovered cardmaking and stamping in 2014. I started documenting my learning experiences on my blog, Kiwi Koncepts, which soon evolved into a place I share my creative process and share inspiration with others. 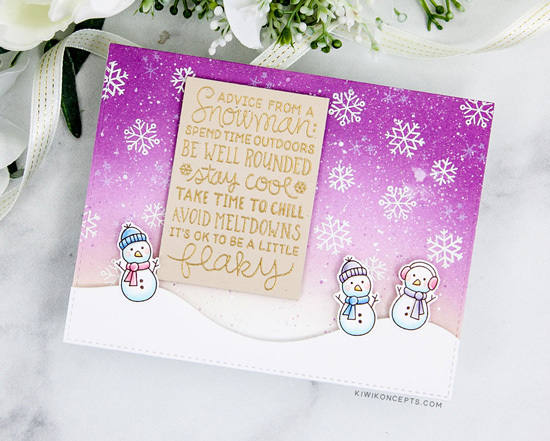 Keeway created this adorable snowy scene using our Snowman Advice Stamp Set. She embossed the big sentiment from the set in gold on kraft paper to use as the focal point of her card. Then she created a snowy scene, adding a snowy hill and three adorable snowmen on each side, also from the Snowman Advice Stamp Set. She colored the snowmen using lovely pastel colors and fussy cut them out to add to her card. 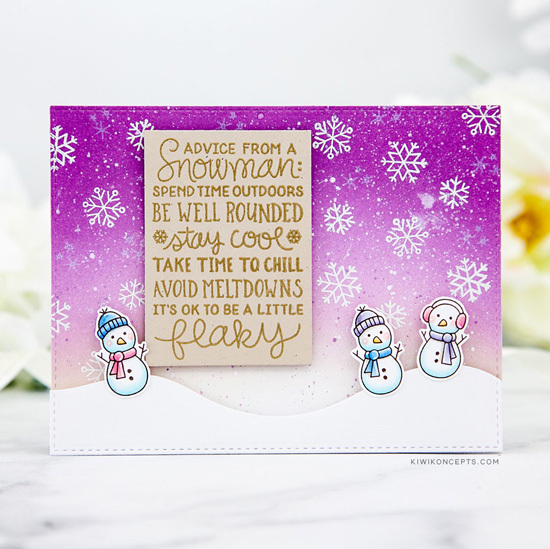 She also used the snowflakes from the Snowman Advice Stamp Set, embossed in white randomly over the gorgeous purple sky! This card is perfect for sending smiles on a cold winter day! Make sure you head over to Kiwi Koncepts to get more details on how she created this card! Thanks so much, Keeway for being our guest today! She will be back for our Deck the Halls with Inky Paws blog hop on Friday, December 7th. 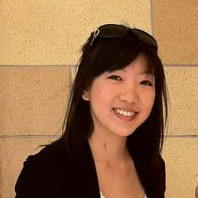 Until then, you can visit her at her blog, Kiwi Koncepts to read more about her adorable projects and say hello! snowmen are so adorable. Just beautiful! Really cute design. Love the sky and that sentiment is just marvelous. Awww, Keeway, this is so cute. I love the sentiment and your scene is adorable, a beautiful colour for your background as well.